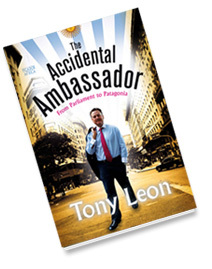 In April 2013, Pan Macmillan published the keenly anticipated diplomatic memoir of Tony Leon which is entitled “The Accidental Ambassador – From Parliament to Patagonia”. This revealing insight into what happens behind embassy walls and how the author went from frontline opposition politics in South Africa to representing the country in three of South America’s intriguing countries – Argentina, Uruguay and Paraguay, is a witty and candid account of the ‘secrets of the diplomatic trade’ and a no-holds barred narrative of the countries in transition on both sides of the South Atlantic. 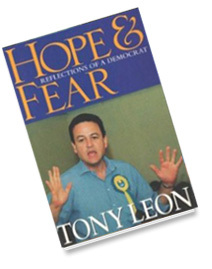 Pieter Wilhelm, the noted journalist, who edited the book, writes: “On the Contrary” records in Tony Leon’s finely focused prose an adventure in ideas that involves vivid, real people – friends, colleagues and ene-mies alike. Many are household names but readers will be startled at Leon’s fresh approach and grasp of the intricate realities and compromises that go into the making of a politician. There is new light here on many of the figures who have shaped modern South Africa … the themes and personalities that emerge from a half-century of memory and intellectual struggle are unique in our records, told from very near the centre of events … Leon is unafraid of allowing glimpses of his rich, private life and the brilliance of the book rests in a careful balance of the public and the private and how they nurture each other. 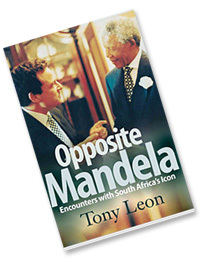 Since the inauguration of Nelson Mandela as South Africa’s president in May 1994, Tony Leon has led the Democratic Party (DP) in Parliament. In four years he has taken the DP from the edge of political extinction to the centre of political debate and massively increased voter support. He has helped turn the party around and contributed significantly to the current political dialogue on the is-sues and challenges concerning the new South Africa. 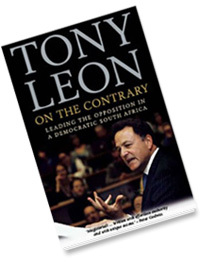 This title contains a selection of Tony Leon’s speeches and writings, covering the critical issues involved in the transition from apartheid to the new democratic order. He speaks and writes with style, insight and with no-holds-barred. He articulates the ingredients now required for this country to become a winning world-class nation, at peace with both itself and the new global order.